TOO LITTLE TOO LATE– Hey Sisyphus, have we met? In outline, the story goes like this. TOO LITTLE TOO LATE – Hey Sisyphus, have we met? 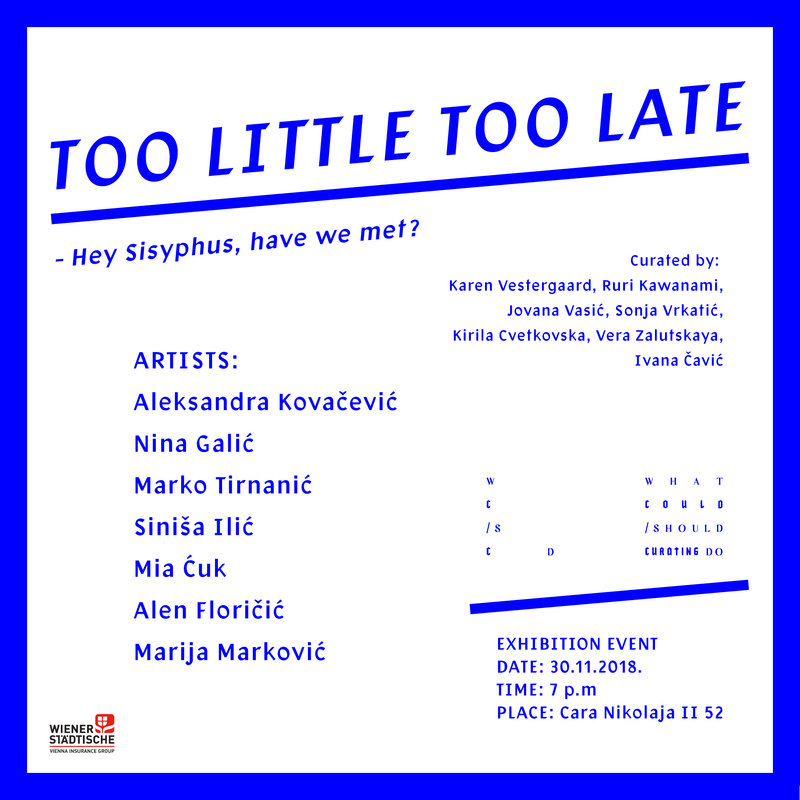 is an open invite for an evening of art and relief on 30th November, at Cara Nikolaja II 52 in Belgrade. Together with artists and the audience, during this transformativeevent, we would like to experience the delicate nature of a failure worthwhile. In a flickering art world full of networking headaches, cliques and strategies, in a society that profits from fear, anguish and self-doubt, what could the light-hearted ones do? Play. This “play” is developed through the space where honesty is welcomed, doubt not frowned upon and restlessness understood. Gambling our way through (literally and metaphorically) together with 7 artists, our fellows on this enterprise, we are building a safe, but alas transient spot, where our uncertainties can be set loose. Maybe while we divert our attention and put our guards down, our worlds will fall apart, and we’ll lose what’s at stake. But in the end, everything may just stay the same as before and we may get what we bargained for. Mia Ćuk is a Serbian artist living in Novi Sad, her interest in the materiality of “the photographic” led her to work with gestures of the image focusing on its disappearance rather than its creation, hence resulting in mixed and alternative techniques of documentation. Alen Floričić is a Croatian artist based in Rabac. His recent works deal with urban installation and experimental video works often consisting of short loops, thematizing the odd of the human body. Aleksandra Kovačević lives in Belgrade, creating in the realm of internet related art or pop culture, working with video, installation or performance. Her works question issues such as the functionality and determination of meaning, gender constructions, impacts of net culture, language in relation to social problematics. Marija Marković is a Serbian artist living in NYC, creating video works and installations that explore issues of exclusion, waiting or confinement, related to the friction between socialism and capitalism. Marko Tirnanić is a serbian artist living in NYC, exploring socially intimate positions such as control, humiliation and self-indulgence in his experimental video works, installation and public intervention. The WCSCD course is a long term project initiated by Biljana Ćirić together with Supervizuelna, during the three month-long program, invited international cultural producers conducted specific mentoring sessions related to different aspects of curating, offering participants the opportunity to individually and collectively consider the different institutional aspects that often frame curatorial endeavors. For the culmination of the program, participants proposed two collective exhibition events that reflect on their research and involvement within the local context. The first project developed in Belgrade will look into some uncertain working conditions, expectations and appraisals and being pressured to produce. The WCSCD three month-long programme included different institutional visits, studio visits, mentoring sessions, field trips and other informal meetings and exchanges that rounded the final project. Second project organized by WCSCD curators is scheduled for March 2019. The primary mentors for the course included Dorothea von Hantelmann (Bard College, Berlin); Antariksa (co-founding member of KUNCI Cultural Studies Center, Yogyakarta, Indonesia); Elena Filipović (director of Kunsthalle Basel); Tara McDowell (director of curatorial practice at Monash University in Melbourne, Australia); Maria Lind (director of Tensta konsthall, Stockholm); Matt Packer (director of EVA International); Hou Hanru (artistic director of MAXXI Rome, Italy); and Ivet Ćurlin (What, How & for Whom a curatorial collective formed in 1999 and based in Zagreb, Croatia), alongside with the local mentors that included Mia David, Ana Bogdanović, Siniša Ilić, Branislav Dimitrijević and Gallery Matica Srpska curatorial team. The course is a long term project initiated by Biljana Ćirić together with Supervizuelna, with the following institutions as project partners: project patron – Wiener Städtische; partners – The Museum of Contemporary Art Belgrade; GRAD—European Center for Culture and Debate; EVA International – Ireland’s Biennial, ’Novi Sad 2021 – European Capital of Culture’ Foundation and Zepter Museum. The project is supported by: the Goethe Institute in Belgrade; Istituto Italiano di Cultura Belgrado; the Embassy of Sweden; the Embassy of the Kingdom of the Netherlands; the Embassy of Ireland in Greece; the Embassy of Indonesia; the EU Info Centre; Mondriaan Fund, the public cultural funding organization focusing on visual arts and cultural heritage; Pro Helvetia – Swiss Art Council; and galleries Eugster || Belgrade, HESTIA Art Residency & Exhibitions Bureau, Center for the Promotion of Science and Zepter Hotel, Royal Inn Hotel and CAR:GO. Media partners: EUNIC Serbia, RTS3.